At Somerton Eyecare Center, we care about your vision and use the best equipment possible to diagnose your eye-related condition. Whether you need a stronger contact prescription, new glasses, or are interested in laser eye treatment, we can help you. We never cut corners and always do what’s best for you and your vision. Your eyes are one of the most important senses. Let us help you care for them. Our staff is bilingual, highly trained, and family oriented. We have the latest in lens technology; digital lenses, customized to your prescription, offering a wider field of view. Our mission is to build a lasting and trusting relationship for each patient and their families, while improving their quality of life based on their visual demands and needs. You can trust that Somerton Eyecare Center will take care of you. 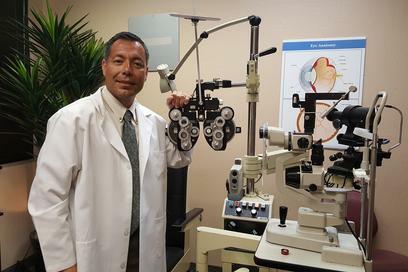 Dr. Dominguez is a graduate of Southern California College of Optometry, Class of 2002. 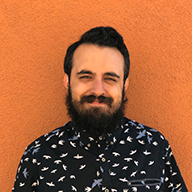 Prior to obtaining his Doctor of Optometry degree, he received his Bachelor degrees in Biology and Minor in Chemistry from Northern Arizona University. Dr. Dominguez trained at Barnett Dulaney Eye Center, IHS Winslow, and IHS Sacatan in Arizona. He has enjoyed private practices in Flagstaff, Yuma, and the Phoenix areas including his first office in Anthem. Dr. Dominguez is fluent in Spanish and welcomes each opportunity to get to know his patients and provide quality eyecare. Born and raised in Flagstaff, Az he knew he would go back and set up practice in his native state. In 2002, he partnered with colleagues to build his first practice “All About Eyes”. Eventually he bought Somerton Eyecare Center that provides bilingual medical eye care in a rural area. He currently practices in this office and specializes in Pediatrics, Geriatrics, Specialty Contacts, and Medical Eye Disease. Disease treatments include: Corneal disease, Diabetic eye disease, Glaucoma, Trauma, and Co-Management of surgical care with surgeons he trusts. 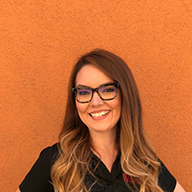 Dr. Dominguez is a strong advocate of private practice and serves as the regional leader in Arizona for the Professional Eyecare Associates of America. This organization provides resources to help individuals who practice Optometry independently or as a group. He also serves as an adjunct clinical professor at the Midwestern College of Optometry. He enjoys the ability to share what he has learned thus far in his profession with students who have the same passion for eyecare as he does. His hunger for learning and teaching is seen when he is with his patients. He treats every patient as if they were a member of his family and provides them with the best care possible. Nancy is the general manager and a licensed optician. She is a graduate of Northern Arizona University, receiving her Bachelor degree in Psychology and minor in Biology. Her parents Dr. James L. Thurber and Gloria Thurber were the co founders of Somerton Eyecare Center. She was lucky enough to work with and gain experience and knowledge from them. After both of their passings due to cancer, she continued managing the business. She has over 15 years experience with working in the optometric practice. As co-owner, she has many administrative responsibilities. However, she always enjoys dispensing glasses and helping someone find that perfect frame. She enjoys spending time with her family and friends. She strives in making each patient’s visit with us a great one, by improving your vision with the latest lens technology. Emilia is our loving Administrative assistant/Claims Specialist. 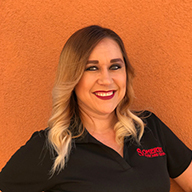 With her high knowledge and over 8 years of experience, Emilia is responsible for assigning the correct insurance and procedural codes to bills. She has been working at Somerton Eye Care Center for over 10 years and has loved every year yet. Emilia provides various kinds of administrative support to all of her peers and takes joy out of doing so. Isbet is our experienced and fun energetic optician. She takes great joy in helping our patients pick out the frame that accentuates their personality. 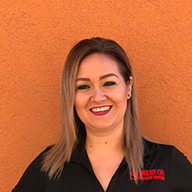 She has been with Somerton Eye Care Center for over 4 years and specializes in individualizing each patients experience. She is a great team player, always willing to help out her fellow co-workers. Karla is our highly energetic and thriving optician. Her outstanding customer service will make you feel comfortable and at home. Tell her your needs and lifestyle. She can make recommendations on customized lenses. She loves to make sure her patients receive her attention. Valeria is our optometric technician. She takes much joy in her profession and loves to interact with patients. She works in a careful fun manner as she confidently guides you through the procedures of your comprehensive examination. Valeria is present during the examination with the doctor. She documents and gathers information for the patient’s visit; partnering with the doctor to exceed patient care. 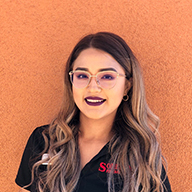 Gabriela is also one of our optometric technicians. 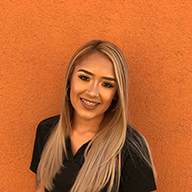 She uses her knowledge and great charisma to make sure her patients leave with a smile on their face. She assists with the testing necessary to provide our patients with our best service. Lourdes is our patient service representative. She has a great attitude and a friendly personality. 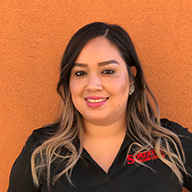 Lourdes is so knowledgeable with insurances that she will be able to help you understand your benefits. She brings her high energy to work everyday and loves to make her patients feel welcomed. Yesenia is our friendly and sweet optician. 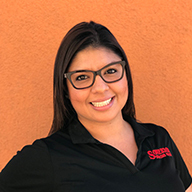 She loves helping patients find the perfect frame and guiding them in choosing the best lens option that suits their needs. 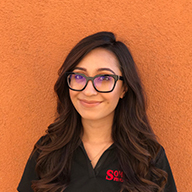 She is a great addition to the team, she enjoys reading and educating herself in everything optical to help herself better understand what is the greatest and latest in the fast advancing lens technology.